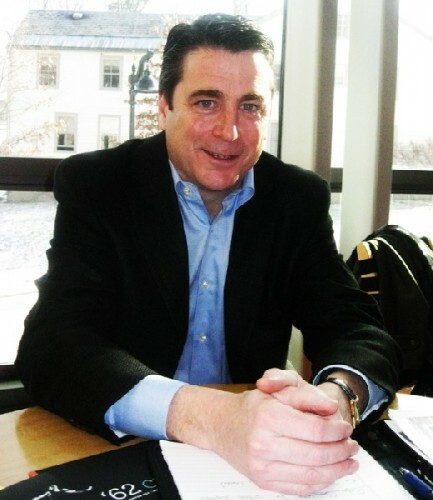 Joe Finnegan is making the transition from Wall Street to a position as General Manager of the Williamstown Theatre Festival. Giuliano photos. 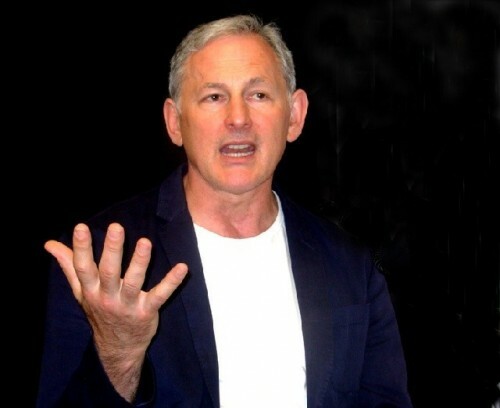 Nicholas Martin will step down following his third seson as artistic director of WTF. Marin is currently directing his Huntington Theatre production of Coward’s Present Laughter on Broadway. Victor Garber stars in Martin’s broadway production. Brooks Ashmanskas who often works with Martin will be on Broadway this summer in Promises Promises. Dylan Baker has another commitment this summer. 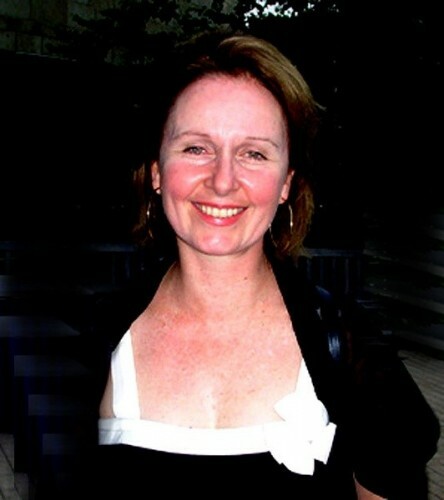 Kate Burton has a long history with WTF. The young director Justin Waldman with Wendie Malick. 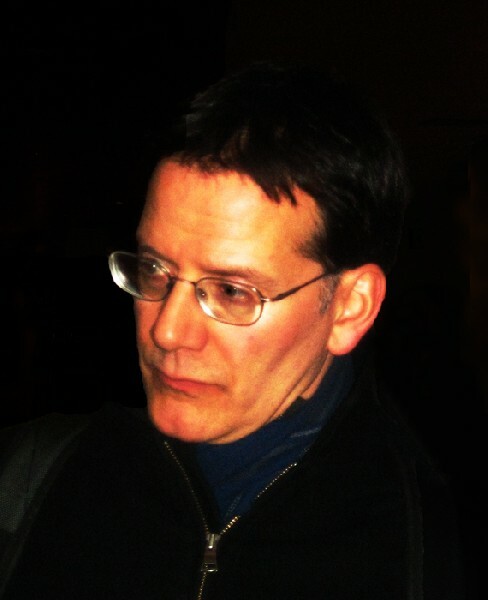 Campbell Scott starred in The Atheist which went on to Off Broadway. 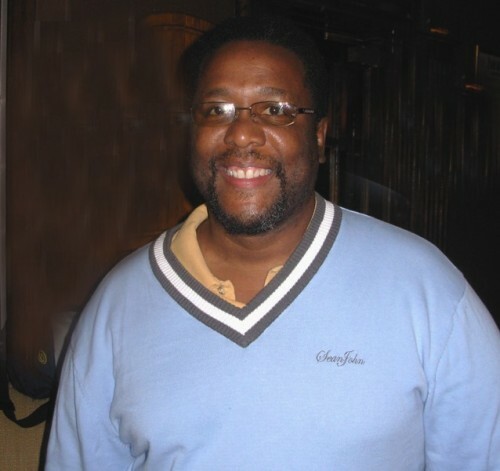 Wendell Pierce of HBO’s The Wire was the heart and soul of Broke-ology. Stepping in at the last minute Kristen Johnson was terrific in The Understudy. File photo. 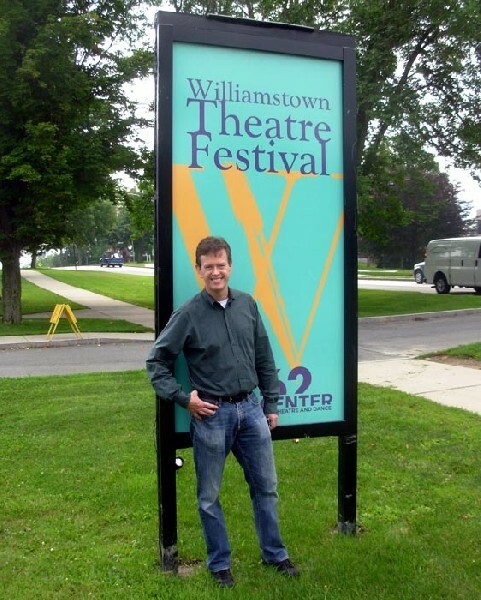 While we are weeks away from a formal announcement it appears that the 2010 season of the Williamstown Theater Festival, which opens on June 30, is getting back on track. There will be four Main Stage and four Nikos Stage productions with a musical. In the first season, 2008, under artistic director, Nicholas Martin, there were nine productions and a musical. Last summer, at the peak of the economic downturn that impacted all arts organizations, without compromising the artistic standards of the renowned festival, the schedule was scaled back to seven productions with no musical. There were four Main Stage productions and just three new plays in the Nikos Theater. Down from five in 2008. Several months ago Martin announced that he will step down at the end of the coming season. It is expected that his replacement will be appointed by June. This will provide an opportunity to be on campus and observe the operation which, in addition to a schedule of plays, also entails training for some 200 apprentices and interns. During a meeting with the handsome, razor sharp, and charming new general manager, Joe Finnegan, he stated that the Board is committed to "Fully supporting Nicky in the season that he wants to present." This entails an upgrade to eight productions. There is a plan to include a musical which is a particular passion for Martin. It is well known that musicals, with their orchestras and generally large casts, are expensive to mount. Last season, it proved to be prohibitively so. But it was also a factor in what was viewed by the majority of critics as a disappointing season. Significantly, none of the new plays in the Nikos Theater went on to New York. From Martin's first season three of five new plays- The Atheist, The Understudy, and Broke-Ology - made it to Off Broadway. 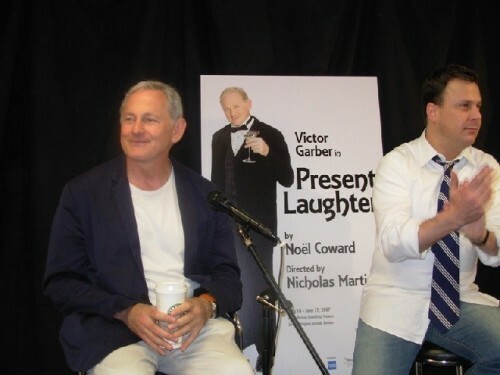 An earlier Huntington Theater production directed by Martin, Noel Coward's, Present Laughter, is currently on Broadway, starring Victor Garber, at the Roundabout Theater. Link to New York Times review. For the last of Martin's three seasons at WTF Finnegan conveyed that everyone is on board backing a great program with every intention of sending more of the Nikos shows on to New York. Four years ago Finnegan settled in Williamstown. The family moved from Stamford, Connecticut because they wanted the kids to grow up someplace other than a suburb of New York. From 1982 to 2002 he had worked as a trader on the floor of the New York Stock Exchange. Poignantly, he conveyed that he lost a lot of friends during 9/11. They had no prior connection with Williamstown but liked what they found here. "We have a college town with all of its energy, and an artistic environment with the Clark, WTF, and Mass MoCA. When we moved here I was not aware that there was a Williamstown Film Festival and an independent movie theatre (Images). We were thrilled by that. We knew nothing about Williams." Finnegan proves to be a quick study. 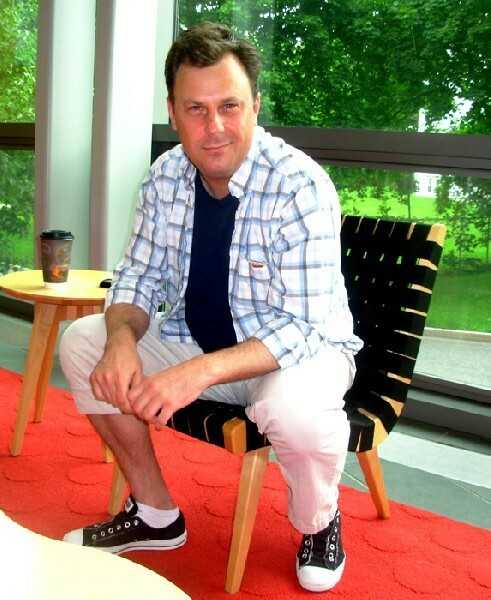 He connected with an old friend, "Steve Lawson (artistic director of the Williamstown Film Festival) and I grew up together in Rye, New York." He is now the president of the Film Festival. It was his first connection with a non profit. There is still a daunting learning curve, from Wall Street and the financial world, to the needs and demands of the creative arts. "Honestly, I am learning on the fly" he said. "In the Stock Exchange you do it right there that moment. You buy or don't buy. This world is about talking about thinking about something that you are thinking about doing something about. That's what happens in the Off Season. This is my first summer at WTF. But, when June 16 rolls around, and 200 people actually arrive here, that's when the doing actually gets done. There's nine months of planning and then on June 16 you light the fuse and away you go." In the field of arts administration there have been enormous changes over the past few decades. In the past the norm was to have a director, artist, curator, or scholar run creative organizations. That individual initiated the aesthetic agenda of the institution while also making business decisions. During an era of brick and mortar expansion, and ever increasing costs, there was a greater need for business, investment, fund raising, and marketing management. This led to a pattern of dual leadership. There was an aesthetic head of the organization as well as the money man. One response was the emergence of museum directors like Tom Krens who combined an MFA with an MBA. The notion of a Ph.D running a major organization became largely obsolete. The last of the breed, arguably, were Philippe de Montebello, at the Metropolitan Museum of Art, now retired, Malcolm Rogers, at Boston's Museum of Fine Arts, and Michael Conforti, of the Clark Art Institute. Joe Thompson, an understudy of Krens at Williams, is typical of the new breed with an MA in art history and an MBA. An inspiration for Finnegan has been the thinking and writing of Michael Kaiser, the President of the John F. Kennedy Performing Arts Center, in Washington, D.C. He describes Kaiser as "A man who had a financial background and ended up helping arts organizations in many cities." Finnegan has studied Kaiser's prolific and insightful books and articles. With its 200 apprentices and interns, the Equity actors cast in productions, for Martin and his creative staff WTF is a complex, unique and expensive operation. There is a year round presence with offices and staff in New York as well as the Berkshires. All of the planning and casting occurs in New York with its focus on the theatre world. Because of the unique arrangement with its host, Williams College, the Berkshire presence of the festival is confined to a narrow but intense window from June 16 through the third week of August. There is a special arrangement with Williams College that allows WTF to administer a program that reaches far beyond mounting a season of Summer Theater. The 200 apprentices and interns occupy dorms and are fed in the college dining rooms. There is also extensive class room, tech, rehearsal, and production space in the 62 Center. Routinely WTF creates sets and costumes that rival Broadway standards. The festival mounts the most elaborate productions of the four major Berkshire theatre companies. Part of that is reflected by the longevity of the festival and, until the recent downturn, its deep pockets. But one unexpected advantage is that during the recent economic crisis it is a renter not an owner of expensive real estate. There is no mortgage or debt service. "Everything is budgeted at $3 million" Finnegan said. "The whole thing is in the same ballpark as last year." That prompted asking about the problems last season, both financial, and artistic. On both fronts he proved to be cautious never crossing the line to comment on Martin's domain. When asked for specific numbers, such as the state of the endowment, or breaking down costs, he said "I am not comfortable talking about that." Of course those figures are available through the Attorney General's office. But there is always a lag in filing those 501C3 reports which do not clarify current status. For all non profits in the past year, particularly university endowments, the changes have been rapid and dramatic. There have been reports that college and university endowments have declined from a third to even half. Williams College has been impacted along with everyone else. As a tenant and partner of the college, however, WTF is a tub on its own bottom. Taking another approach I asked how he would characterize the impact of the past season. "Unfortunately, we faced a tough storm financially with its impact on the donor base as well as the customer base. We fared better than some of our peers but it was pretty tough sledding for all non profitsÂ…I have a sensitivity to what Nicky does and never cross the line. The Board is fully supporting him to have the season that he wants. I stand in a position with a responsibility to the Board and to Nicky." 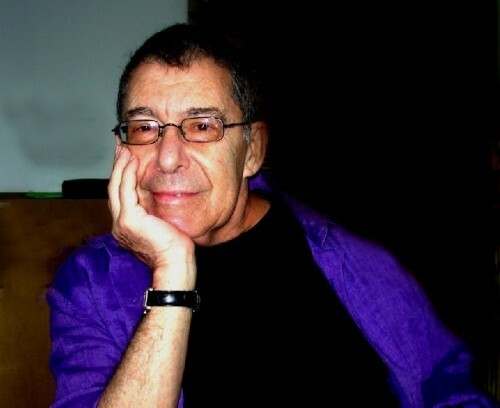 During the fall of 2008, just after the WTF season ended, Martin was scheduled to direct productions in Los Angeles and New York. The LA show opened but while in rehearsal in New York he suffered a stroke. Still, he assembled the 2009 season in Williamstown. An interview at the start of last season was poignant. After that, we caught only glimpses of him compared to the first season when he was ubiquitous. Those working with him are fiercely devoted and loyal. As an artist and director he inspires much more than respect. One sensed last year that he was protected. But that failed to shield him from some really harsh reviews. It begs the question of what to expect this season. In particular, I asked Finnegan in what way his job is intended to make life easier for Martin. The position entails enormous administrative oversight. It is logical to assume that many of those burdens will be passed along to staff leaving Martin to focus on the aesthetic process. But it proved to be a dicey question. "How to make it better for him is tricky and it's a question I can't answer on the record" he said. "Part of my mission is to reengage the local audience." We had a background discussion of the decade of decline for WTF that preceded Martin's appointment in 2008. The three years under Roger Rees entailed high points but was generally problematic. It is widely considered that the festival had declined for a decade. There were the golden years of the late Christopher Reeve, Kate Burton, Blythe Danner, her daughter Gwyneth Paltrow and Olympia Dukakis to mention but a few of the stars who regularly summered in Williamstown. "The period you talk about had nothing to do with Nicky" he said. "People who are fond of theatre have fallen away. My hope is that with my help we can bridge the gap and bring people back into the fold. By presenting the show they want so see. For Nicky Martin and his team, at the end of the day, that is one of the measures of a successful festival. And the experiences the apprentices have are an important measure. It is not something you can measure in dollars." Part of the problem is out of sight means out of mind. When WTF shuts down at the end of August its off season presence shifts to New York. Even during the summer many Berkshire based critics feel that WTF is overly focused off site. The PR and marketing is generated out of New York and the media contact dispatched from the office does not arrive until just before opening night. There is little advance and it takes time for the PR staff to get up to speed with an ever more diverse local media . Traditionally, the PR and marketing strategy has focused on New Yorkers visiting the Berkshires during the summer. That is still a significant aspect of ticket sales but it has become ever more vital to develop local audiences through a year round presence. In the past few seasons, particularly with a tough economy, the thinking of Berkshire arts organizations increasingly has turned to developing untapped local audiences. This is particularly significant during the shoulder seasons. Shakespeare & Company, for example, reports strong ticket sales through the fall. By then WTF had folded its tent. Currently, S&Co. is mounting its second, winter production with great success. By promoting and marketing year round it is more likely that a company will have a broader base during high season when there is stiff competition to sell advance tickets. By now, in mid February, Tanglewood has sold out its Fourth of July, James Taylor/ Carole King weekend. Tanglewood announced before the Holidays. Surely those season tickets made nifty upscale stocking stuffers. It is also money in the bank earning interest months before paying any bills. Reminded of that Finnegan asked if I had gotten a press release on the WTF Fa La La pitch? Can't recall. And if so, what has been the marketing since then? Is the website updated? Why is the NY press office on sleep mode? Who is pitching the stories that keep WTF alive in the media? Can we really wait until June 30 to get the juices flowing? By then we have a lot on our plate. During the season critics are out on average between five and seven nights a week. There is more than any individual can cover. We have to make tough choices and set priorities. The successful recent reading of Yasmina Reza's ART, at the Clark, was a huge step in the right direction. The 380 capacity audience at the Clark represents potential ticket buyers next summer. More importantly, as local residents, they are likely to attend more than one show. Those New Yorkers are in for just one weekend with a lot of options to select from. Given the new realities of marketing and audience development WTF has a learning curve to earn back its market share. During its glory days there wasn't the same level of competition. WTF, however, remains one of the nation's foremost regional companies. It appears that Finnegan is up to speed with the challenges and plans to initiate new marketing strategies and synergy with other arts presenters. Particularly with its formidable neighbors The Clark and Mass MoCA. It plans once again to work with the Clark cross promoting its summer exhibition Picasso Looks at Degas. They will connect with a reading of Steve Martin's Picasso at the Lapin Agile. There will be day passes and twofer ticket deals. He describes a schedule of shows that appeal to the "Clark crowd" as well as one that is pitched to the "Mass MoCA crowd." There will be promotional partnering in both instances. "Somebody coming to the Clark is just 55 yards from a world class theater. Parents dropping their kids off at the Williams soccer camp will be made aware that there is a Sunday matinee. It is also a matter of who you know" Finnegan said. "There is a local presence. The more you're here, the more you know." Arguably, the reading at the Clark grew out of those very local connections. During the off season Finnegan is dividing his time between Williamstown with a couple of days each week in New York. He discussed some of the challenges that Martin faces in organizing a season. It is logical to be in New York to make those decisions. Over the years, directors like Martin tend to attract an informal company of actors and designers they work with. Year after year you see the same familiar faces. For the past couple of years we have seen a lot of the director, Justin Waldman, the actors Brooks Ashmanskas, Kate Burton, Wendie Malick, Campbell Scott, James Waterston and Dylan Baker both as actor and director. Finnegan became animated as he discussed actors and productions over the past four years. "Brooks is a good example of a regular who won't be here this summer," he said. Currently Brooks is on Broadway in Martin's production of Noel Coward's Present Laughter. It seems that he will be doing the Broadway show of Promises Promises. Similarly, Dylan Baker, who we saw recently as a villain in the hit TV series The Good Wife, has been cast in God of Carnage. It always comes down to the last minute as to who is available. Added to that are complex equity rules. Actors will pull out if there is a call from Hollywood. Broadway casting decisions are made during the summer. He recalled two summers ago when Kristen Johnson stepped in at the last minute and did a terrific job in The Understudy. We both marveled at the incredible sets for the play. Particularly with just a two week run in the Nikos Theater. It is that commitment to quality that makes WTF unique on the short list of America's foremost regional theatres. In particular, Finnegan is excited about nailing down the rights, as well as funding, to bring a musical back to WTF. "If all our dreams come true you will be very happy. We will ask our friends to support a musical and our goal will be to wow everybody." When we discussed the talent and mix of shows under negotiation Finnegan became excited. For a money man he appears to know a lot about the theatre with a superb grasp of the players. I commented "I sense the passion leaking out of the suit." The remark floored him evoking a hearty but knowing laugh. "Passion. That's a great word. I am new to this world but it is the passion that Nicky brings to the stage and inspires in others. You're happy for his success and for the actors who work with him and the staff that works under him." He talked about his work with the Williamstown Film Festival. How it brought him in contact with directors who had come out of the intensive WTF experience. "The festival (WTF) is more than what's on stage. That's the icing on the cake but not why people support all of these programs." While not providing any numbers he states that, after a rough patch last year, the endowment is secure and well managed. Asked for a combination of fiscal and aesthetic prognosis he came up with an interesting response. He described himself as a dedicated film buff. He quoted Chance the Gardner (Peter Sellers) from one of his favorite films Being There (1979). For whatever reason the reclusive, simple minded gardner is taken for a financial wizard. When asked about the state of the economy Chance answers "There will be growth in the spring." With a laugh, as well as cryptic wisdom, Finnegan uttered "I think there will be growth in the spring. And there will be." How refreshing. It's not often that you encounter a suit with a sense of humor. Exit laughing. "Knew Joey in college, he will be a great addition to the festival!"